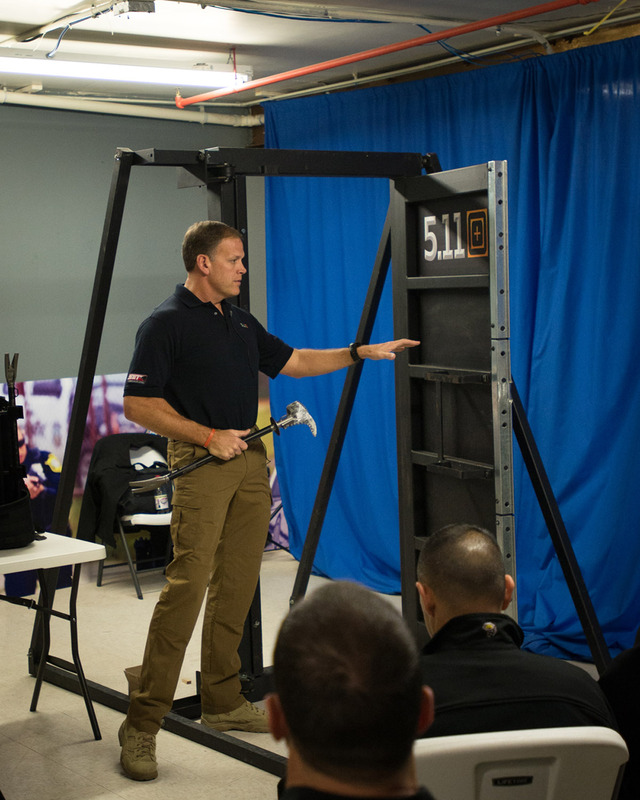 NEWARK, NJ — On December 17, Atlantic Uniform held a demonstration to NJ Public Safety officials and members, with a new and innovative door breaching system, at their downtown Newark location. 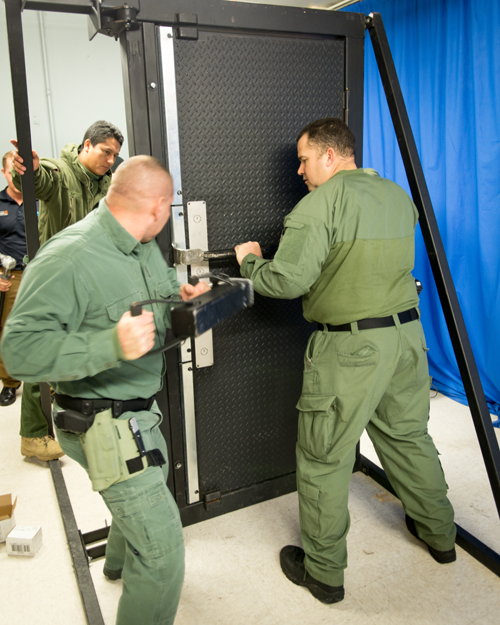 One of the biggest challenges facing Law Enforcement, SWOT, Fire and EMS is a locked door. 5.11 Tactical® has partnered with Sweden Entry Tools (S.E.T.) to develop the 5.11 Tactical Breaching Tool System of rated Expert Entry Equipment, a new concept of mechanical breaching based on a line of mechanical entry tools and a full size breaching training door. Atlantic Uniform, one of the nation’s foremost dealers in 5.11 Tactical® products and apparel, has set up a training area in their Newark location, and offers the use of the only 5.11 Tactical® training door in New Jersey. They can provide training in the use of these advanced breaching tools, as well as demonstrate their use to interested NJ agencies and municipalities. Effective breaching minimizes operator exposure, and maximizes effectiveness, but requires the right tools and most importantly the proper training. Designed for the durability and longevity of use, the 5.11 Breaching Tools are constructed with a proprietary TacForged steel alloy for superior light weight and incredible tool strength. The tool shafts are designed for rigidity, utilizing hydraulic pipe steel to eliminate all spring tension in the tool; applying maximum mechanical advantage on the breaching site where it is needed most. There are two kits available. The Heavy Breaching Kit features a full complement of 5.11’s breaching tools securely mounted in a steel-framed heavy-duty backpack. The Heavy Breaching Kit includes the MultiBreacher, MultiPry, MiniRam and EdgeBender, a system capable of defeating inward-opening, outward-opening doors of almost any construction. The Active Patrol Breaching Kit provides officers with new options to make entry when time is of the essence and includes 5.11’s MultiPry and MultiSledge tools. Compact enough to fit in today’s crowded patrol vehicles, the Active Patrol Breaching Kit comes packed in a durable nylon case with a quick-detach shoulder strap. The 5.11 Breaching Tool System, sold and registered only to law enforcement, fire, security and rescue personnel, allows breaching of inward and outward opening wooden, steel and security doors. At the launch event at Atlantic Uniform, different public service officials, officers, and SWOT members were able to try out the system firsthand, which often allowed entry in less than 5 seconds. A video of the event, as well as some of the officer’s comments on the system, can be seen on the Atlantic Uniform website. According to one member of the Essex County Police Department, “This is clearly one of the fastest, easiest and most complete breaching system available today”. For more information or to watch the video visit www.njpoliceoutfitters.com.